Back to school and back to work. The fun of the holidays are over and the hustle and bustle of our busy daily lives has resumed. What was once a house full of energy is now all but a memory and reality of normal daily life has hit. Are you ready? Even more importantly, is your pet ready? 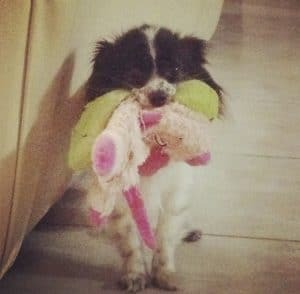 Your precious pooch or puss has just spent the last 6+ weeks surrounded by their faithful family and now they are a little confused and wondering where you’ve gone. Working is a reality we all understand, but sadly our pets are at a bit of a loss and a bored pooch left at home will often find a way to occupy themselves – and it can often be destructive to your furniture or themselves. Our team at Animal Emergency Service have a few simple ways to help keep your lonely Lassie happy in your absence. 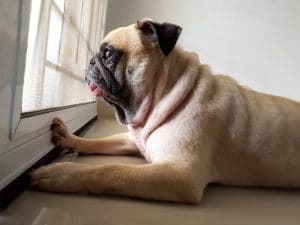 Leave some curtains open so your pet can watch the outside world. Turn on a TV, the visuals and audio can help make your pet feel like they’re less alone. Leave some treat filled ‘boredom buster’ toys around the house for your pet to enjoy. Fill them with a pet safe treat such as natural peanut butter or biscuits. TIP: On warmer days, try freezing the treats to help keep them cool. Provide a scavenger hunt. 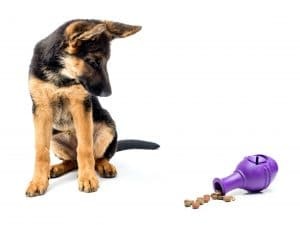 Try leaving treats around the house for your pet to search for during the day. Rotate toys for them to play with during the day. 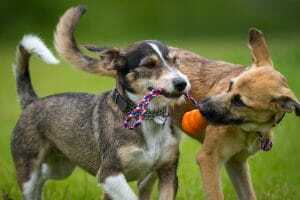 If your pet is toy orientated, having a collection of toys which you rotate will provide fresh stimulation each day! Morning walks are a great way to start the day! Why not wear them out before you go to work. It’s a great opportunity to get fit together and the best time of the day for exercise during these warmer months. If your dog is pet friendly, why not look into doggy daycare? This will keep your pet happy during the day, provide socialization and leave your mind at ease knowing they are in a safe monitored environment while you’re at work. Dogs are pack animals. Sometimes having a friend can help reduce anxiety and they can help keep each other entertained in your absence – but if this is the option you take, ensure you still provide stimulation for them both while you’re away to avoid double the destruction. Don’t forget your furry friend. While cats are often quite content to spend your absence sleeping off their stressful lives of luxury, dogs are programmed to crave companionship – isn’t that why we love them so much? You are the best part of their lives so be good to your best mate. They will be waiting by the door to greet you when you get home, but hopefully these tips can help make that wait a little less lonely. If you suspect your pet is showing signs of boredom, consult your veterinarian for behavioural advice.